When you walk in to the Firehouse sports bar on Calloway Drive you may notice one stool standing out among the rest. The pink stool is in honor of Natalie Barrick, who lost her battle against breast cancer in September 2017. Her sister Cynthia says she was a joy. Firehouse is owed Natalie's family. Family says she was a valiant warrior in her fight against the disease. She was considered a leader in the local Relay for Life chapter, fighting to find a cure by raising money for the American Cancer Society. 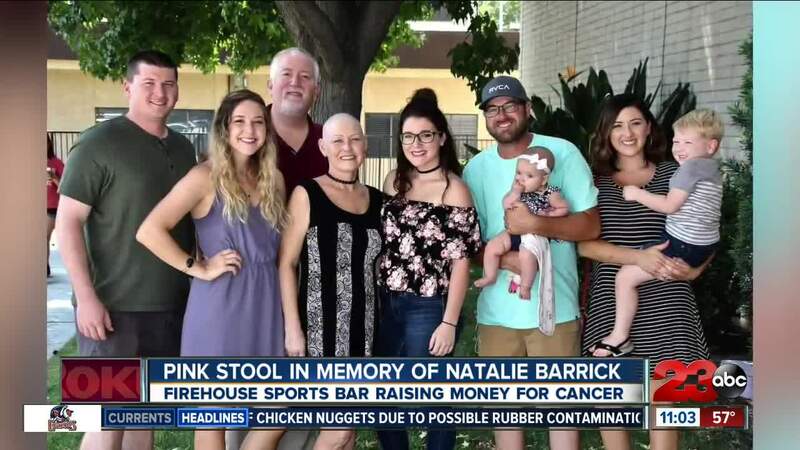 After her death, Natalie's family decided to continue her fight with the pink stool for customers to sit in. "Anyone that sits in the pink stool we donate 5% of the ticket to various causes that were near and dear to my sister,"
A pink stool is located at the White Lane location. Along with the stools, Firehouse has a Relay For Life team that will participate in the Bakersfield Relay for Life May 14th, 2019.